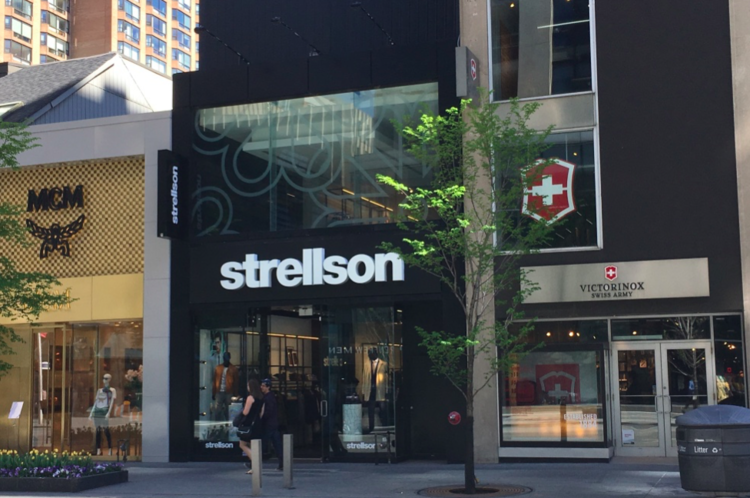 Upscale Swiss men’s fashion brand Strellson has relocated its Toronto flagship store to 95 Bloor Street West, in a retail space just up the street from one it vacated late last year. The company officially opened the store (which ‘softly’ opened several months ago) last week with an event hosted in partnership with Sharp Magazine. Strellson occupies a two-level retail space formerly occupied by Town Shoes, with 2,125 square feet on its ground floor as well as almost as much space on its second level. The store carries a wide assortment of Strellson fashions, ranging from casual clothing to suits and formalwear, as well as shirts, accessories and related items. New to the men’s collection are men’s bags and wallets in both leather and nylon/cotton — items will be available this summer as new product continues to arrive in the store. 95 Bloor Street West is located next to luxury brand MCM, which opened its first Canadian store at 93 Bloor Street West earlier in the fall. Swiss retailer Victorianox is on the other side at 95A Bloor Street West, occupying the corner shared with St. Thomas Street. Luxury brand Hermes recently opened a spectacular flagship directly across the street from the new Strellson, and another luxury menswear brand, Ermenegildo Zegna, has also announced that it will open across the street as the area continues to see the addition of new luxury brands.